Black Rovsun HZB-45 is an automatic, stainless steel, portable, commercial grade ice maker with a sleek design and compact size that can be used as a standalone- freestanding or built-in under the counter unit. With a large 33-pound storage capacity in its storage bin, it is designed mainly for commercial use at bars, restaurants, supermarkets, grocery stores and cafes. It can produce 100 pounds of clear ice every per 12 to 18 minutes and in 24 hours. Black Rovsun Ice Maker weighs 63 pounds with the dimensions of 18 x 16 x 31 inches. It is an efficient and safe product to use with an ETL certification, that is built with the very good quality components. The stainless steel makes it rust-proof and more durable for longer service time and you can make ice for many years. And the high-end look and feel are complemented by the anti-fingerprint panel with black frosting. The standard ice cube it will make measures 0.9 x 0.9 x 0.9 inches and you can change the size easily through the control panel- choose thin, medium size or thick. You have the Add Water, Timer, Ice, Full, Clean and On/Off options on the LED-backlit panel. You can simply flip the black lid at the front to remove your ice cubes easily. It is quite a user-friendly ice maker with the mirror surface is easy to clean. It is very easy to put together as you only need to install the pipe and you’ll get a user manual in the box. And you can operate the smart display panel easily- it is pretty much self-explanatory. The auto clean feature is also great to have. The low noise 270-watt power R134a, 240g Vesicant C5H10 compressor (115 Volts and 60 Hz) runs quietly and will consume less energy than similar models as an energy saving unit. It is safe to leave it running overnight. 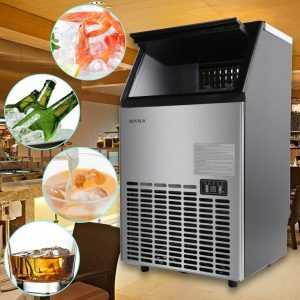 Thanks to its beautiful design with stainless steel and black and compact size, you can use it as a standalone or under counter ice maker in commercial settings like cafes, bars, restaurants, supermarkets, shops and your own home if you need a high capacity ice maker. The five accessories included in the box are drain hose, water inlet hose, ice scoop and two connectors. 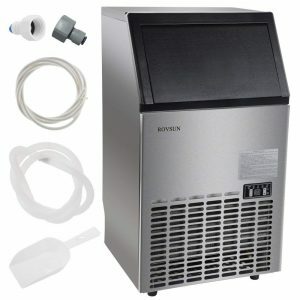 You’ll get the Rovsun Ice Maker shipped quickly via USPS, UPS or FedEx as the product is stocked in New Jersey and California. You can put it under your kitchen cabinet or counter easily. It can be used in SN, N, ST and T climates with an ambient temperature of 50 to 100 degrees Fahrenheit. The water supply temperature is between 41 and 95 degrees Fahrenheit and the water pressure between 0.04 and 0.6 MPa. It is decent value for money overall.